On May 16, 2012, just two weeks after the official groundbreaking by MidAmerican Solar and First Solar, the first of nearly 9 million thin-film PV panels was installed on the world’s largest solar project currently under construction: The Topaz Solar Farm, located in San Luis Obispo County, California. Pacific Gas and Electric was there when the solar panel was installed since the California utility will be purchasing the electricity from the 550MW project - enough power for about 160,000 average California homes – under a 25-year power purchase agreement that will help the utility meet California’s mandate to generate 33 percent of its power from renewable sources by 2020. According to a number of recent reports, more and more electric utilities are expected to be seen playing out this same solar scenario. That’s because solar power use by utilities worldwide is on an upswing, whether that power comes from utility-owned solar power plants, power bought from commercial developers, or individual homeowner roof-top PVs. And utilities worldwide know that this continued solar expansion will hinge on moving towards making smart grid connections with renewable energy a priority. Despite the recession, solar was the fastest growing source of new electric power generated by U.S. utilities in 2011, according to an April 2012 Solar Electric Power Association report. For the fourth year, U.S. utilities tapped a record amount of new solar power amounting to a 38 percent increase in installations and a 120 percent growth in megawatts installed over 2010. Meanwhile,electric utilities worldwideare expressing their confidence about their advances in smart grid upgrades, according to a new PriceWaterhouseCoopers Global Power & Utilities Survey that indicates the industry believes it will have a smart grid in place by 2030. While 2011 saw record levels of new investment worldwide into renewable energy, particularly solar power, the outlook for 2012 is far less assured for some nations, according to Ernst & Young’s latest quarterly global renewable energy “Country Attractiveness Indices” (CAI) report releasedFebruary 28, 2012. The CAI scored of 40 countries for their renewable energy markets, infrastructures, and potential for use of individual technologies. CAI ranked China in first place and Germany as third. The U.S. remained in second place as developers tapped grants and loan guarantee programs that have all but expired. While the Ernst & Young report predicts that renewable technologies will continue to expand in 2012 in the “emerging markets” due to ambitious installation programs, the more “established” markets within the EU will continue to face increasing financial issues. With U.S. solar incentives gone, the American solar market is not expected to expand at the same rate in 2012, according to the report. Nevertheless, utilities have continued to embrace solar and other renewable power. “Today, the most solar-active utilities are no longer theoretically talking about solar in the future – they are engaged with solar today in substantial ways. As solar markets grow, these utilities are already adapting to this rapid growth and the operational and regulatory changes that it requires, and in the process laying a path that other utilities will soon follow,” accordingSolar Electric Power Association. For the U.S., a drop in coal power may play an unanticipated role in boosting new solar power use by utilities. According to the Energy Market Perspective (EMP) released in December 2011 by consulting firm Black & Veatch, the potential retirement of 61,500MW of coal-fired power plants by 2020 will speed the pace of utilities to move towards more renewable power since the U.S. generates 50 percent of its electricity from coal plants. (These numbers are backed up by the U.S. Energy Information Administration which predicts coal use in the U.S. will fall to a 25-year low.) Currently, renewable energy makes up only 8 percent of U.S .energy generation but the EMP report concludes renewable energy capacity will more than double its overall percentage of the U.S. energy mix by 2036, in part to off-set anticipated declines from coal-fired generation. In 2011, almost half of the U.S. surge in solar growth was driven by utility-based solar, either by building their own solar power plants or contracting for the power through power purchase agreements (PPA) and solar renewable energy credits, according to the Solar Electric Power Association. In all, U.S. utilities interconnected over 62,500 PV systems onto the grid in 2011. 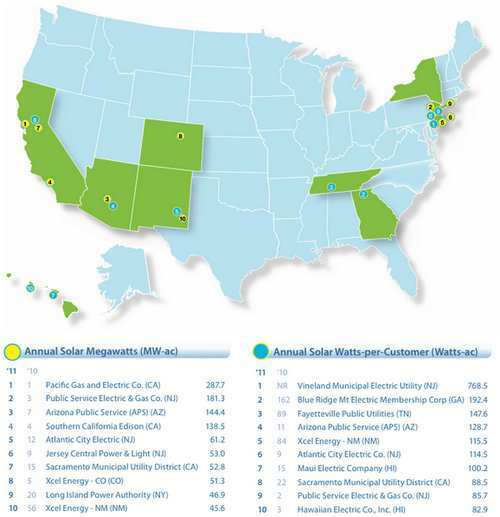 SEPA released their “Top 10” ranking of U.S. utilities based on solar growth on April 18, 2012. 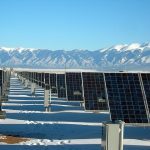 Surveying more than 240 utilities and electric co-operatives which represent more than 99 percent of the U.S. solar market, SEPA found that nearly 1GW of the total 1.5GW of new solar that came online in 2011 was credited to just 10 utilities. SEPA had set the bar twice as high as it had been in previous years, requiring at least 45MW to make their Top 10 list in 2011. Among SEPA’s findings were that 13 utilities had interconnected more than 1,000 PV systems and 22 added more than 500 systems. “This annual volume of smaller, distributed solar interconnections is unlike anything the utility industry has previously managed, and conservative forecasts indicate that this number will grow to more than 150,000 interconnections in 2015,” notes the SEPA. For the fourth year in a row, California’s Pacific Gas & Electric (PG&E) had added the most solar to the grid in 2011 with 288MW. While it’s not surprising that the majority of the top ten utilities were located in the sun-baked western states, what is more telling were the East Coast utilities that made the list, including 1 in New York State and 3 in New Jersey. While the Solar Electric Power Association’s Top 10 ranking targeted U.S. utilities based on the amount of solar power they have added, other recent reports rank the same utilities based on other parameters. 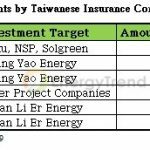 What’s striking about the Target Rock report is that it concluded that the highest scorers on their sustainability list also outpaced their utility peers in stock market returns. And as a group, these utilities out-performed both utility-specific sector indexes and the broader markets – including both the Dow Jones Industrial Average and S&P 500 - for a 10-year period that ended December 31, 2011. Joining SDG&E in the top 5 of the UtiliQ list were Pacific Gas and Electric, Austin Energy, Pinnacle West, and Edison International. Meanwhile, FierceSmartGrid.comused input from utility executives and analysts to select their Top 5 utility smart grid leaders for 2011 based on “vision, innovation, time to deploy, technology, and the potential to take the next steps needed to advance the industry, as well as percentage of smart meters deployed compared to service territory size.” According to this report, the top 5 are: Austin Energy, Arizona’s Salt River Project, Portland General Electric, Pacific Gas and Electric, and San Diego Gas & Electric. San Diego Gas & Electric took the top “intelligent utilities” position of the UtiliQ list based on their work towards developing smart grid initiatives that are supported by IT spending. According to SunGuard, an energy and commodities solutions company,the utility industry will need to increasingly leverage such technology in order to meet the emerging challenges of deploying solar power into the grid. Among the technology trends SunGuard has identified, one stand-out is that deploying solar and other renewables is driving the need for to increase “analytics”to balance smooth operations between predictable power demands with unpredictable or intermittent renewable energy sources. That means making smart grid IT a priority in order to increase the ability to both manage these new renewable energy sources within their transmission networks and control energy demand by consumers. PriceWaterhouseCoopers’Global Power & Utilities Survey released in April 2012 indicates utility companies worldwide believe they will have operational smart grid technology in place by 2030. But after surveying 72 power and utility companies in 43 countries, PwC concluded that these utilities will face a "trilemma" of balancing affordability, security and sustainability. But PwC’s survey also found that a surprising 80 percent of North American and 74 percent of European utilities cited a lack of “customer engagement” as the most likely factor slowing smart grid technology from living up to its potential. The survey found utilities are particularly concerned about establishing closer communication with their customers (66 percent) and managing peak energy demand (62 percent). According to the SEPA:“Utility driven solar procurement is vital to rapid solar market expansion,”but this volume of new distributed solar interconnections is unlike anything the utility industry has previously managed and conservative forecasts indicate that this number will more than double to more than 150,000 interconnections in 2015. With 9,000MW of renewable projects with signed power purchase agreements in the pipeline and over 3,000MW currently in various stages of construction, SEPA sees a thriving solar-utility partnership bringing a “positive impact” on the U.S. economy and the domestic energy supply. In fact, this “new normal” of accelerating the integration of renewable energy sources with innovative smart grid development by utilities is likely to grow at a frenzied pace as utilities scramble to add those emerging new projects online over the next few years that were funded by the Recovery Act. And with over 25 utility-scale solar projects recently given the go-ahead for development on public lands, even more interconnections are loaming in the near future. The PriceWaterhouseCoopers Global Power & Utilities Survey indicates the utility industries, both domestic and international, believe they have a handle on the smart grid technology needed for not just interconnecting renewable energy sources to replace fossil fuel plants being phased out, but also in dealing with new demands posed by electric vehicle charging. The investment will be notable. While the US government has virtually eliminated its funding and loans for solar and other renewable technologies, support for smart grid projects remains unwavering. In fact, efforts to make the smart grid smarter are being supported by U.S. Department of Energy in order to accommodate the “new normal” of renewable power coming online, pressure to improve energy efficiency while reducing consumption, making transmission lines less vulnerable, and the reality that electric vehicles have arrived to stay. And according to the DOE, utilities investing in smart grid tech now could save $46 billion to $117 billion over 20 years by avoiding the need to build more power plants, transmission lines, and substations. For the utilities this “new normal” looks like a sweet deal: Invest in grid technology in the short term to save money in the long term on distributing power from utility-scale renewable power plants the utilities let other developers finance and build.